In the face of expected population growth and high demand for housing supply, it is indispensible for Vienna and Hong Kong to create new mixed-use districts. The development of new towns also present the opportunity to implement and test sustainable and inclusive urban policies. Vienna is among the cities known for stringent environmental and social regulations for new housing projects. The seminar opened a discussion between urban planning experts on visions and principles guiding new district development projects in the two cities. In the introduction, Prof. Hess pointed out that Vienna has a tradition of social housing projects going back to the 1920s, which brought about high standards of innovative design until today. The priority for housing made the city itself the most influential player in the field, as it now owns 220,000 flats and can therefore help keep average rents in the property market affordable. It also allows the city to set standards for sustainable planning and experiment with flexible models of urban renewal and new developments. The influence of the city also extends to private housing developments in as far as these receive municipal subsidies for construction. In Vienna’s ‘Four Pillars Model’, an independent and interdisciplinary expert jury first has to assess proposed housing projects on planning grounds. The costs are also monitored from the construction phase to the service charges levied on tenants in later years. There is a comprehensive ecological check on, for example, building materials, energy consumption and the provision of green spaces. Lastly, housing projects need to be ‘socially sustainable’ by offering housing to different social groups and also included provisions for tenants with special needs (ranging from families with children, the disabled and elderly tenants to creative artists). The public/private partnership inherent in this model has been cost-effective while at the same time guaranteeing that Vienna has a great variety of buildings and housing estates in conformity with the ambitious goals of its strategic development goals. Mrs. Angelika Winkler presented some aspects of Seestadt Aspern, a new town development project which will eventually accommodate 20,000 residents and create a corresponding number of jobs. She emphasized that Vienna’s planning focus was foremost ‘on people’ rather than ‘houses’. Aspern will have social housing with a mix of low and middle-income families. Crucial elements making the new neighborhood attractive are extensive ‘green’ features such as parks and the urban lake and good public transport connections. The first metro line was, in fact, built long before the first tenants moved in. There is a planning priority for ‘shared public space’. Public space is considered to be a crucial aspect of the overall ‘quality of life’ for residents. As a consequence, the use of private cars is discouraged, there will be less parking space than previously mandated by building regulations. Cars will have to be parked in neighborhood garages, while the suface area of the new town will be largely free of private car traffic. Vienna now experiments with cargo bikes, home delivery, e-bike sharing systems, and multi-modal route planning via apps. The city wants new towns to replicate the model of ground floor shopping streets as in the old city areas. Mrs. Winkler explained the ‘shared space’ concept using the redesigned Mariahilfer Straße as an example. Such projects give less dedicated space for cars, while opening streets to pedestrians and ‘parklets’ for grassroot initiatives. Street festivals and temporary use (e.g. for sledding and fun activities for children) are means to spark citizens’ imagination to envision spaces without cars. In her detailed presentation, Ms. Phyllis Li made clear that population growth had always been the major challenge for Hong Kong planners, characterized by the twin needs of providing employment and housing for large numbers of immigrants. She explained that successive phases of new town development in Hong Kong from the 1950s to the1990s helped balance the population distribution and improve the quality of life for residents. But they were also faced with new difficulties, for instance a mismatch of homes and jobs, as factories moved to China while leaving the resident population behind in ‘old’ commercial areas. The new town development also created large daily commuting flows and indirectly encouraged social segregation. There was now a need to reshape the city towards ‘smart growth’ and the construction of ‘green’, ‘smart’ buildings housing ‘inclusive communities’. Ms Li first gave an historical overview over previous planning phases. In the 1950s, Hong Kong dealt with large immigration inflows while there were severe land constraints in the colony. First developments in Kowloon, such as the Kwun Tong area or Shek Kip Mei helped to built public housing for one million residents by 1965. Following the first Colony Outline Plan (1972) and the first New Territories Development Plan, further new towns for 1.8 million residents could be built. The new towns in the New Territories were planned as self-contained districts, trying to balance housing and land for factory buildings. The late 1970s saw a ‘second generation’ of new towns built in this tradition, to be followed by a ‘third generation’ in the 1980s and 1990s. Examples of the latter include Tung Chung as the core development surrounding the airport transport and logistics hub. About 50% of Hong Kong’s population now lives in new towns developed during these decades. They are, however, no longer the ‘self-contained’ districts as originally planned. The structural changes in the economy and the exodus of industrial production has reduced the number of jobs in the new towns (today only 23% of the HK total) and therefore to massive daily commuting to the core business districts. There is also an unhealthy concentration of lower income residents in certain new towns, while many social facilities remain inadequate. For now and the foreseeable future, HK new town development is faced by a number of challenges. The population is now ageing very rapidly, while the active labor force is shrinking. Hong Kong is also facing keen economic competition in the region and globally and must therefore diversify its skills base. Innovation and technology need to be emphasized also in the new towns. The city must improve its liveability under the unavoidable constraints of high-density development. New mass transit links are urgently needed and more land is required for a new type of mixed-use and sustainable new town. There is a growing need for redevelopment even in existing new towns, where at least 326.000 housing units are now considered ‘old’ and in need of replacement. Additional pressure comes from necessary adaption to climate change and the need to become more environmentally friendly. The challenges can be summed up as (a) Enhanving Liveability, (b) Creating Capacity for Further Growth and (c) Enhancing the Overall Economic Competitiveness of Hong Kong’s population. The government wants Hong Kong to be a compact, transit-oriented but also more liveable and sustainable city. To explain these principles, Ms. Li focused on the development plan for the Hung Shui Kiu district with its strategic links to the Kwai Tsing port, the airport at Chek Lap Kok and to Shenzhen. It is expected that the new town’s residential area will combine private and public housing (21,000 new flats for eventually 218,000 people), to be achieved mostly by converting brownfield sites. Commercial activity will concentrate around rail stations and business in a “Logistics Enterprise and Technology Quarter”. In the mixed-use areas there will be an array of community, education and leisure facilities. The plan envisages a ‘green spine’ with a regenerated river channel system, pedestrian and cycle paths, and open green spaces. New town development is to adhere to the goals of a ‘smart, green and resilient’ city by better land-use planning, the creation of office spaces and thereby moving jobs closer to residential areas. The government will continue to promote energy efficiency in buildings, easy access to public transport and an internal Green Transit Corridor, among other measures. The speakers discussed what the two cities could learn from each other. Ms. Li said that Hong Kong admires Vienna for its high ranking in liveability and citizens’ satisfaction surveys. Hong Kong’s general wealth and its very low unemployment figures are not sufficient indicators for the quality of life. The city needs to become stronger in developing and implementing detailed schemes to increase its own liveability. She welcomed the idea of seeing public space as an extension of private space, the ‘shared space’ concept and temporary interventions to make neighborhoods livelier. 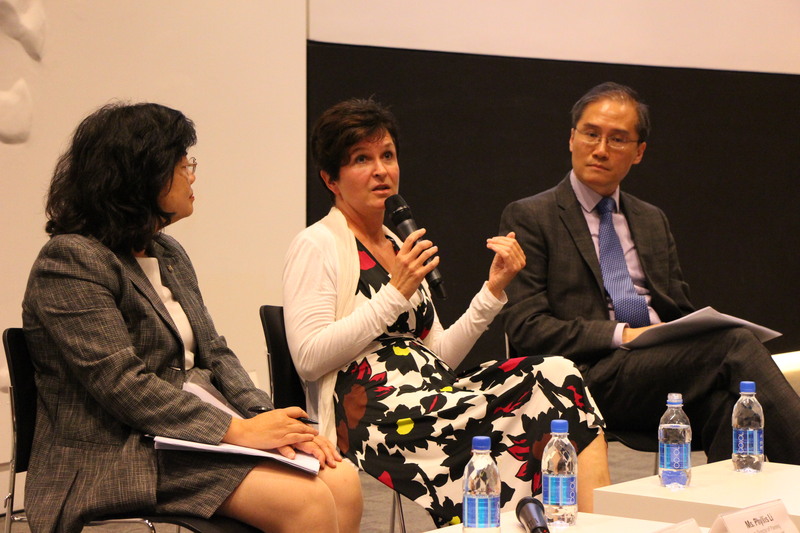 Mrs. Winkler suggested that Vienna could look to Hong Kong to find solutions for the management of rapid urban growth while still maintaining a high quality of life for residents. As regards liveability, she pointed out that Vienna had very good experiences with citizens’ participation. New social housing, for example, makes use of the ‘Baugruppen’ model, which lets future residents make inputs already at the design stage. In some cases, this has resulted in tailor-made housing complexes or ‘themed buildings’ for, for example, women or bikers. The more citizens can be drawn into the planning process, the greater popular satisfaction rates could be later on. Often, citizens themselves would contribute to finding cheaper or more cost-effective solutions. Concerns raised in the open debate suggested the need for close monitoring of the strategies’ implementations and follow-up measurement of performance. Regulatory frameworks were mentioned as a potential impediment to urban innovations. Mrs. Winkler responded that even though Vienna has to consider existing laws, new town development would sometimes allow testing innovative solutions, which could then trigger relevant changes in citywide regulations. On the question of balance between quality of life and density, Ms. Li remarked that in Hong Kong new towns density would be compensated by more green areas, while existing high-density districts will not see further population increase. Among other key issues discussed was how to ensure that businesses settle in new towns and provide employment, especially in times when the number of jobs worldwide is shrinking. There was also agreement that with respect of the ageing population and further technology use for citizens’ benefit, both cities were still at the initial stage of brainstorming.